Having read many authors and being analysing the taunt history of Kashmir for a while, I often get crude gut feelings. I feel agitated of not having faith in the regional electoral system and in the idea of India. Many Kashmiri people feel reluctant to call themselves patriotic Indians, even though there have been attempts by pro- Indian parties and its leaders to win our hearts. The question which Indian leaders should ask themselves is why aren't many Kashmiri people passionate Indian nationalists? Isn't Kashmir a dispute which is recognised world over? Why are our concerns only sought over by the Indian law, by convictions of ideological treacheries to the Indian nation. The case of Ireland and the recent Scotland referandum have been effective exercises for perceiving the political and ethnic realities in these countries. But in our case there have been such blatant naiveties in the lack of good judgement for emendations of our constitutional machinery by our local politicians. Any voice of Kashmiri nationalism is hostile. Promises of infrastructure and other forms of economic well being don't pay over on our aspirations. This electoral system in Kashmir which has been running in a sorry state of strategic alliances for a while, where enemies are made friends for power is a shallow answer by India to Kashmir, where they want the world to perceive that all is well inside the Kashmir territory. Is this administrative turpitude through elections an answer to the Kashmir problem? Why is India behaving deaf and dumb to the international outcries for solving the problem? "Technically, I hold an Indian passport, but I don't call myself as an Indian," a Kashmiri said, who i read somewhere. Indian politicians rather call people like us 'fringe elements of the nation and 'traitors who have been fed by the enemies of India' and so on. After all, they are responsible for ethnic polarisation through debase ideologies which had roots in European fascism: Hindus came before the Muslims came, but why take this as an excuse to inflict discrimination on certain groups? There are many leaders in India who believe Muslims are not part of the emancipation of the Hindu race, unless and until they betray their ideals and principles. These ideologies have ended communities in a blood feud, that actually paved way for seculars, whose philosophy emanated from the west, to rule a country with diversified faiths. Kashmir and its neighbouring territory in the state too have resulted in similar inclinations. People with ideologies like me either end up disappeared or get interrogated in a torture cell. But they forgot the historical mistakes done by turncoat politicians at the expense of Kashmiri blood and for myriad anarchies for which India has no answer. They cannot address the root problem. The rebellions which have happened in Kashmir, the intensity of them amidst world's most militarised apparatus are nothing less than extraordinary. India has tried to smarty get away with it and has inflicted its opinion and power on us through various harms. One thing which is for sure. India wants the land of Kashmir. They won't care if we have to go to Pakistan like what happened in partition. The demography of the region which includes Jammu and Ladakh are having variant political opinions, and India has imposed many problems in a controversial land which include Hindu nationalism, pogroms, hate speeches, state corruption, incompetencies in leadership and diversified political mandates through evasive manifestos that lead us nowhere. In Pakistan, if any Kashmiri speaks against its national union, he also ends up behind bars. Azad Kashmir has been taken in a larceny by Pakistan, by controversial military aggression and now they want the Indian part as well. Militarism and wars are an answer by these two countries for helping the impoverished Kashmiri race. This is a dilemma in which we suffer. Many Kashmiris are not Indian patriots nor Pakistani patriots. Kashmiri people are looked upon suspicion due to the calamities which have been created by the political class. 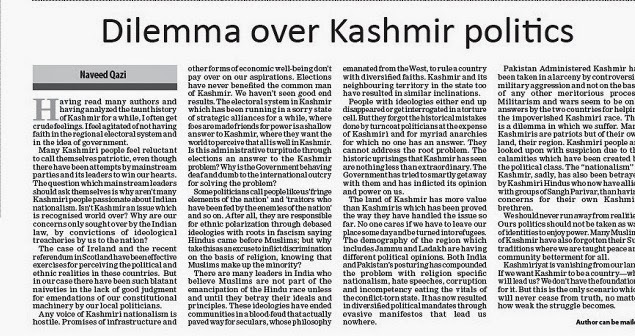 The nationalism of Kashmir, sadly, has also been betrayed by Kashmiri Hindus who now take alliance with Sangh Parivar, than having concerns for their own Kashmiri brethren. We should never run away from realities. Ours politics should not be taken as war of identities to enjoy power. Many Muslims of Kashmir have also forgotten their Sufi traditions where their esoterism taught peace and community betterment for all. Kashmiriyat is vanishing from our land. If we want Kashmir to be a country, who will lead us? We dont have the foundations for it. But this is the only scenario which will never cease from truth, no matter how weak our struggle becomes. Kashmir is gifted with strategic leverages for emerging nations. That’s why, it’s is a vale of caged aspirations. The current geo strategic position for Kashmir is dictated by three emerging nations, which are bred with Secular, Islamic and Communist ideologies. Kashmir is a mountainous valley and is surrounded by a hilly and mountainous terrain. The land of Jammu, Muzafarabad, Gilgit, Baltistan and Ladakh constitute an area of highlands. They border Pakistan, Afghanistan, Xinjiang, and some parts of Chinese administered Tibet. Kashmir also has proximity to Central Asian Republics. With the nature of increased arm strengths developed by India, Pakistan and China, the geo strategic position of Jammu and Kashmir continues to get importance. Sir Owen Dixon was a judge from the Australian High Court, whose meticulous report drafted to UN in 1950 received a commendation for the obstinacy of his analysis of the Kashmir resolution from the Security Council. He is regarded as an Australian scholar of impeccable credentials. Infact Major William Alan Reid, who was an observer with the U.N Military Observers Group in Kashmir (UNMOGIP) got inspired by his work for his B.A Honours thesis titled “Sir Owen Dixons Mediation of the Kashmir Dispute” (July 2000) for which the writer is greatly indebted. Reid is currently working on the doctoral thesis for the same subject. He has even consulted his notes, some of his fifty interviews, his diary and personal correspondence as well as the Australian archives, besides other published works. To add more facts, there has been a tradition of Australian scholarship on India represented by Professors like Robin J Moore, Ian Coplan and B. Millar to name a few. There has been no transparency in discussions arising from bilateral talks on Kashmir. From the last few years, calling off the Kashmir dispute has been the favourite argument arising out of Indian media commentators and political leaders. It is because of existing narration of implanting fervent Indian nationalism inside Kashmir valley. Economic development, financial incentives and being part of India’s GDP growth have been other reasons given to call off Kashmir dispute. But is it fair? Why did India and Pakistan make attempts to reconcile through international agreements in the past at the first place, despite several wars fought on the borders? All the material on this blog can not be used without permission. Facts have been complied through various sources for public access only. Links, pictures and quotes have been provided for reference only and are the property of the respective owner(s). © Insights:Kashmir. All rights reserved.